I was working on pulling one of the logs out of the creek one day. 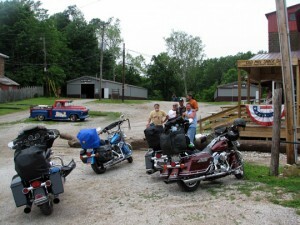 Some bikers stopped by and watched. Then they came down and helped. The photo shows us sitting on the big log we pulled out. ( We didn’t use the bikes – we used my tractor.) 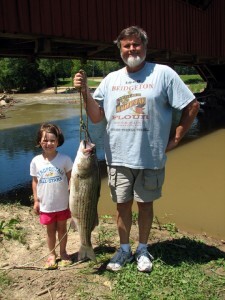 Here is a big fish my granddaughter (Cinnamon) and I caught under the covered bridge. The reservoir held the flood water back until the Wabash River returned to normal, then they turned it loose. The water crashed down through the creek for a long long time. Folks were catching some pretty big fish. We believe the fish were being pulled from the bottom of the big lake and washed down stream with the flood waters. I think we caught the biggest one …. it was 36 inches long. ! ! ! I must admit this is the second time I have come across your site and Im lovin it! I added your website to my rss reader. Looking forward to see more posts!